China-backed Egiiin Gol and two other hydropower projects could disturb a sensitive Siberian river ecosystem feeding into Lake Baikal. By Eugene Simonov, a Russian environmentalist who founded the Rivers without Boundaries Coalition. An earlier version of this article, produced by Rivers without Boundaries, was first published by Russia Beyond the Headlines. Every Chinese person knows about one place in Siberia: Lake Baikal. It is not necessarily famous for its unique biodiversity or for being the deepest lake in the world. Rather, every winter, radio broadcasts warn Chinese listeners about “cold air masses that are moving in from Lake Baikal...” It’s also the subject of a popular Chinese folk song. Chinese people are beginning to value Lake Baikal and are increasingly coming as tourists to see it. Some visitors are even investing in the risky tourism business around the lake. Recently, the China-based Well of the World company proposed pouring Baikal water into bottles to quench Chinese thirst. But this nature-friendly relationship could be severely damaged, as the China Export-Import Bank (China EXIM Bank) has pledged a soft loan to Mongolia for a project that may tip the fragile ecological balance of the ancient lake. On November 11, 2015, Mongolia and China issued a joint statement that calls for the development of large industrial projects including major coal and hydropower. For that, Mongolia secured a U.S.$1 billion loan from the China EXIM Bank, which it intends to use for the construction of the Egiin Gol hydropower project. A $100 million concession for access roads and bridges has been awarded to China Gezhouba, and construction activity began during the harsh winter months. These energy schemes are essential parts of China’s New Silk Road Initiative, aimed at integrating the country with its neighbors. But in the spring, Chinese authorities intervened to suspend the dam project until due diligence is carried out on transboundary impacts. This highlights the lack of environmental safeguards and green development guidelines under the Silk Road, which provides polluting state-owned companies that are no longer welcome at home with opportunities to invest in infrastructure, energy, and heavy industry in neighboring countries. The hydropower project is located on the Eg River near its confluence with the Selenge River, the main source of Lake Baikal. Feasibility studies for the hydropower dam were completed 10 years ago under the auspices of the Asian Development Bank in an ill-directed attempt to help Mongolia utilize renewable energy. Although it is obvious that the electricity generation potential of the rapidly drying rivers of Mongolia is 3,000 times smaller than that of its wind and sun potential, the World Bank followed the Chinese script. It conducted feasibility studies for several coal projects and two more large dams in the Baikal Basin. 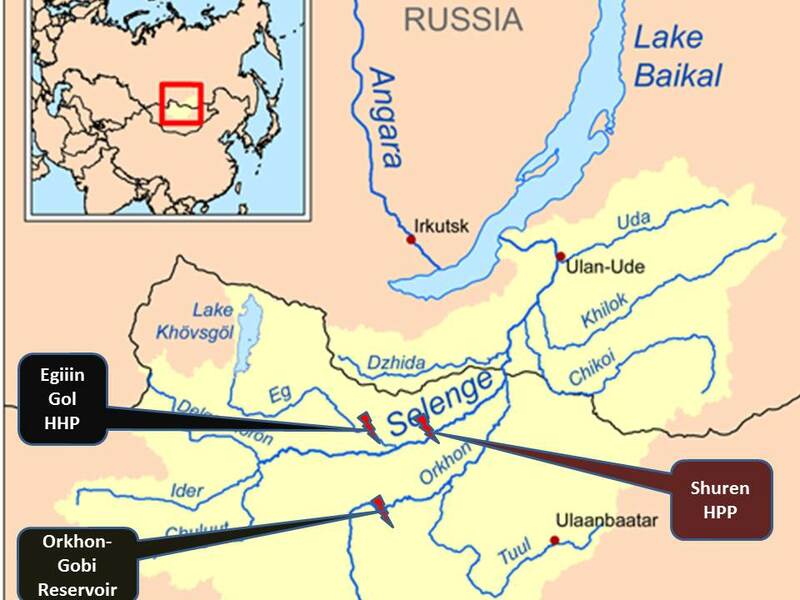 One of them—the Shuren Hydro dam—is planned on the Selenge River itself. Mongolian government agencies are looking at 10 more hydropower dam locations on the Baikal Basin justified by the need to “de-carbonize” the energy sector and achieve energy independence from Russia. The International Union for Conservation of Nature reported that the combined effects of the projects on the lake are not fully known and could potentially seriously damage its UNESCO World Heritage site status. The World Heritage Committee discussed the dams that could damage Lake Baikal at a meeting in Bonn, Germany, in July 2015. The committee set forth requirements for impact assessment of Egin Gol and two other projects, as well as the cumulative impacts assessment of all three dams. The committee requested that Mongolia (and, by default, China) not approve any of the projects until all assessments for dams have been completed and reviewed by the World Heritage Center. The ecosystem of the lake has already been severely damaged by the construction of the Irkutsk Hydropower plant built upstream in Russia in 1960. This, along with prolonged drought in Mongolia, has led to a decline in the lake’s water levels. Climate change and pollution combined to create an ecological and socio-economic crisis on the Baikal Lake shore with massive invasive algae blooms, a decline in fisheries, and an increase in severe peat fires in the Selenge River delta. So how come China, which is prioritizing a cleaner environment at home and as a G20 leader is promoting “green development” globally, is making such a dangerous mistake and starting work on Egin Gol? This is a consequence of gaps still present in the design of China’s New Silk Road Initiative, an initiative aimed at integrating the country with its neighbors and with global markets. However great it is at boosting new economic cooperation, the Silk Road Initiative so far lacks clear environmental safeguards and specific green development guidelines. Grand plans for “new economic corridors” are not subjected to strategic environmental assessments to avoid pitfalls and select the best alternatives. Finally, there is no mechanism for consultation with stakeholders living along the Silk Road. Without this, Chinese investors lack information on actual environmental and social risks—or they get it too late, as in this case when Gezhouba had to stop construction this spring on the order of supervising agencies. Now they are likely to conduct due diligence on Egin Gol. Most likely, Chinese agencies pursuing energy cooperation with Mongolia have not yet assessed the environmental effects of various investment options and did not even notice trans-boundary water issues. And then all of a sudden this spring, EXIM Bank received a letter from the people of Russia’s Kabansk District in the Selenge River Delta and learned that the project it is supporting may harm Lake Baikal, the source of cold winter air in China. An alternative way forward was proposed by the 64,000 people who signed a petition last year asking Mongolia, Russia, and China to support solar and wind instead of hydropower and coal. China, with its ambitions to develop a large-scale renewable industry, should listen to these voices. A year after the Avaaz appeal to the three presidents of China, Mongolia, and Russia, we learned that at least one of them took to heart the message of the public petition. I know that Mongolia plans to build hydroelectricity facilities in the Selenga River basin. We would like to study these plans very carefully with our friends in Mongolia and China. Russia and international environmental protection organizations have made their position on these hydropower plans known: this project could create some risks for water supply to Russia’s Irkutsk Region and affect the unique ecology of Lake Baikal, as Selenga is the main river flowing into Lake Baikal. We realize that Mongolia’s energy shortage is a serious issue. Clearly, this is something we must reflect on and we need to resolve this issue. But there are different ways to resolve this problem, above all by developing the entire region’s energy sector. For example, Russian power stations could increase electricity supplies to Mongolia’s northern regions. We have yet to hear Xi Jinping and Elbegdorj answer Putin’s appeal. Other good news came from Buryatia Republic on Lake Baikal’s shores, where, on June 27, arrived a delegation of the World Bank (WB) and Mongolian Mining Infrastructure Investment Support (MINIS) Project officials. After four years of unceasing appeals from Rivers without Boundaries, the WB MINIS Project finally agreed to undertake consultations on regional environmental assessment (REA) and environmental and social impact assessment (ESIA) plans for the proposed Shuren Hydropower Project on the Selenge River, and for the Orkhon River Flow Regulation and Reservoir Project in Russian Federation territory. Rivers without Boundaries sincerely welcomes this attempt to start a dialogue with affected communities in the Republic of Buryatia and the Irkutsk Region, and consult with local community groups, local and national Civil Society Organizations (CCOs), experts, officials with interest in the MINIS project, and the Selenge basin. We hope that the MINIS Project and the WB will also pay serious attention to substantive questions raised by RwB and many local stakeholders regarding conducting strategic regional environmental assessment (REA) first and only then deciding whether to proceed with detailed ESIAs for particular dam projects if they are still relevant. They also requested that ESIA for Egiin Gol Hydro should be disclosed to the public and fully considered when conducting cumulative impact assessment (part of REA) for all dams planned in the Selenge River Basin. Now that the WB MINIS Project has decided to hold comprehensive consultations on terms of reference for REA and ESIA for two other planned dams in the Selenge Basin, Chinese agencies have a good chance to discuss and assess the Egiin Gol Hydro ESIA in a consultation process designed according to international standards of the World Bank. Since Chinese agencies and companies who stopped Egiin Gol Hydro construction have already shown wisdom and desire to avoid harm, we hope that this opportunity also will be used for good.